“What are my options?” When considering breast augmentation, that’s typically one of the first questions women ask our plastic surgeon, and it’s one of the most important. The good news is Dr. Richard Zeff offers a range of implant choices, and they are committed to helping you find the right option for your needs through a comprehensive consultation process and honest communication. Below, you will find details on the breast implant selection process. If you would like more information, please don’t hesitate to contact our practice. Saline implants are silicone shells filled with sterile saltwater transferred directly from IV solution bags, whereas silicone gel breast implants are filled with a more natural-feeling gel. 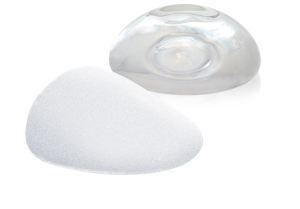 Both saline and silicone gel breast implants are approved by the U.S. Food and Drug Administration (FDA). This approval means that these breast implants have been rigorously researched and tested for safety. We offer smooth round implants in both silicone gel and saline based varieties at our plastic surgery center. Silicone gel breast implants are known to be less prone to rippling, and they are often good options for women who are very thin. While saline implants are less expensive and require a smaller incision, silicone gel breast implants generally look and feel more natural. Our plastic surgeon is often asked about “shaped” and “anatomic” implants. In general, they feel that only women who have had mastectomies require an implant that offers both size and shape. Most women, no matter how small their breasts, usually have an underlying shape that is simply enhanced by the implants. How will I know which breast implant is right for me? The initial breast augmentation consultation is a very important step in the process for women considering this treatment. Our plastic surgeon personalizes each consultation and spend time educating each patient on her options to help her make the best decision. During your initial consultation, Dr. Zeff will listen to all of your questions and concerns about breast implants. We are one of the few practices in New England to use the Mentor® Volume Sizing System to help determine the size that will be best for your needs and goals. It’s important to remember that adding volume to the breasts is not just about enhancing size – it’s also about improving projection and proportions. Ultimately, the best breast implant options are those that fulfill your goals and best enhance your individual anatomy. We will go over these options in detail with you at your consultation and guide you in finding the best possible choice. For a variety of reasons, some women may find that they want to “upgrade” or somehow alter the results of a previous breast augmentation surgery. Patients typically consider revisional breast surgery in order to: exchange saline implants for silicone gel implants or vice-versa; go from a larger implant to a smaller implant; address dissatisfaction or complications stemming from a breast augmentation by another surgeon; or have the implants removed altogether. Dr. Zeff is an extensively trained breast surgeon who can perform breast revision surgery to help you achieve your goals with beautiful, natural-looking results. These are all excellent companies. Our surgeon is always happy to consider a patient’s preference if expressed. If you would like more information on breast implant options, or if you would like to schedule a consultation to talk more about the breast augmentation procedure, please contact our practice today.